Read the book & seen the video a hundred times….its hard to imagine how much of an extreme environment this is to to swim in – Lewis Pugh put his life on the line for a cause which we should all be more aware of, the least we can do is to try and be more responsible & aware of the damage we cause to the the environment! Mr. Lewis : -> Congratulations for your achivements. Mum was right – this was not a normal thing to do. And standing on the edge of the ice, I realised I had never been more frightened. Not just because minus 1.7°C was the coldest water any human had ever swum in. Or because the previous day’s test swim had gone horribly wrong. Not because the water was ink black, and it was 4.2 long, cold kilometres to the bottom. Not even because of the polar bears. Because one shouldn’t be able to swim at the North Pole in the first place. Two years previously, 23 per cent of the Arctic ice cover had melted. 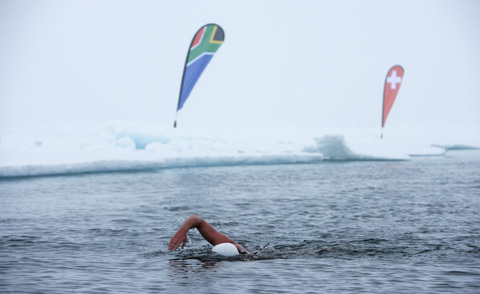 I was swimming to draw the world’s attention to the effect of climate change on the Arctic. The swim took 18 minutes and 50 seconds. And the combined efforts of a dedicated team that kept hold of the vision. Their motivation turned an impossible kilometre into 10 possible hundred-metre stretches. Each section represented a nation, and the people who brought me here. Their flags spurred me on.